UMhlobo Wenene FM is hosting international singer Tamia live on the Masigoduke Show from 15:00pm – 18:00pm on Thursday. While in South Africa, the singer will perform three shows in Johannesburg, Cape Town and Durban. Surprise your valentine with @realtamiaworld tickets. 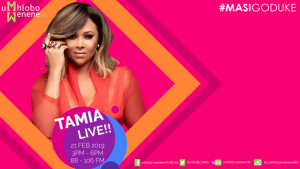 The post WATCH: Tamia live on Umhlobo Wenene FM appeared first on SABC News – Breaking news, special reports, world, business, sport coverage of all South African current events. Africa's news leader..